The people have spoken. The bastards. Donald Trump is the president-elect of the United States. In a decidedly un-Trump-like victory speech, he was gracious to Hillary Clinton, thanking her for her service, and made no mention of building a wall, deporting immigrants, excluding Muslims, jailing his opponent, or any of the other keynote promises of his campaign. In a related note, Canada's immigration website crashed due to traffic overload. Really. Today is Wednesday, November 9, the 314th day of 2016, with 52 days remaining. There are 15 days until Thanksgiving, 42 days until the winter solstice, 44 days until Festivus, 46 days until Christmas Day, and 72 days until Donald Trump becomes president of the United States. On this day in 1938, Nazis looted and burned synagogues and Jewish-owned stores and houses in Germany and Austria on Kristallnacht, the "night of broken glass." Jewish homes, hospitals, and schools were ransacked, as the attackers demolished buildings with sledgehammers. 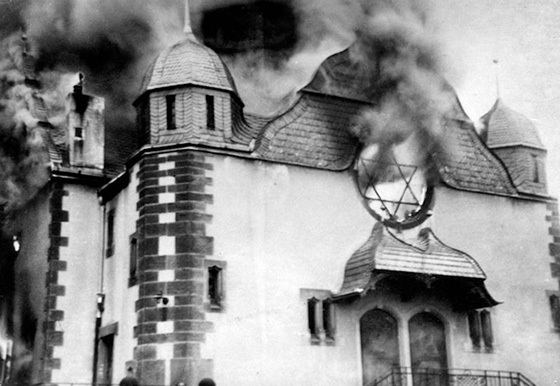 Over 1,000 synagogues were burned (95 in Vienna alone) and over 7,000 Jewish businesses destroyed or damaged. It is viewed by historians as the beginning of the Final Solution and The Holocaust. Among other things, today is also Chaos Never Dies Day. The origins of this holiday are not documented, but it's all over the Internet, so you know it must be true. Florida man develops hepatitis from energy drinks. And it wasn't the sugar or caffeine. As of this writing, The KGB Quotations Database contains 41,139 entries. Check it out. Thomas Berry, Catholic priest of the Passionist order, cultural historian and ecotheologian; Hedy Lamarr, Austrian and American film actress and inventor; Hugh Leonard, Irish dramatist, television writer and essayist; Carl Sagan, American astronomer, cosmologist, astrophysicist, astrobiologist, author, science popularizer, and science communicator; Sargent Shriver, American politician and activist; Anne Sexton, Pulitzer Prize-winning American poet; and Mary Travers, American singer-songwriter and member of the folk music group Peter, Paul and Mary. "In the United States, anybody can be president. That's the problem." From the BBC: Five ways a Donald Trump presidency changes the world. The press blew this election, with potentially horrifying consequences. This election cycle revealed a critical tension between the press’ self-perception and its failure to defend those norms when they were under frontal attack. Not only did many news outlets lower the bar for Trump and never raise it; by doing so, they subjected themselves to the same dismal standard. If your birthday is August 2, you're 50 years old, and your parents lived in New York or the northeast on November 9, 1965, odds are pretty good you were conceived during the Great Northeast Blackout. California, Massachusetts and Nevada voted to legalize recreational marijuana, joining Alaska, Colorado, Oregon, Washington state and Washington, DC. As you see, KGB Report is now a daily effort, and I'd appreciate it if you can share us with your friends and, perhaps, click on the link below and become a patron, or send a donation to me here in the KGB Kave at 1512 Annette Avenue, South Park, PA 15129. Aside from some consulting work, KGB Report and other writing efforts are looking more and more like my main source of income. So if you like us, chip in a buck or ten every month to keep us on the air. Becoming a patron will also get you free copies of any books we publish on Amazon or Kindle in the coming year. Thanks for your support!